Additional photos of beer-costumed bicyclists available upon request. PENINSULA, Ohio (October 11, 2013) – The continuing shutdown of the federal government has visitors barred from all facilities and trails in the Cuyahoga Valley National Park, including the Ohio & Erie Canal Towpath Trail. For the 4th year in a row, Century Cycles bicycle shop is planning their “All Hail the Ale!” Night Ride on the Towpath Trail in celebration of Cleveland Beer Week. The event is in tribute to the special place hopped beverages hold in the hearts of many bicyclists, and will take place the evening of Saturday, October 19th at 1621 Main Street/Route 303 in Peninsula. If the government shutdown continues through the 19th, participants will not be able to ride their bicycles on the Towpath Trail, but all other activities associated with the event will go on as planned. “They can shut down the trail, but they can't shut down the party!” said Doug Charnock, Sales Manager at Century Cycles in Peninsula. 6:30pm – 7:30pm: Participants arrive at the store to check in. Everyone is encouraged to dress as their favorite beer. While beer costumes are not required, they are highly encouraged. Those in costume can win prizes donated by Century Cycles and Sierra Nevada Brewing Company, plus they won't have their beer loyalty questioned. While waiting for the other festivities to start, you can enjoy cycle-your-own-smoothies on our famous Blender Bike. 7:30pm: Prize raffle will begin, with all those who checked in wearing beer costumes eligible. The grand prize will be awarded for the best costume, as judged by fellow participants. 8:00pm: Should the Towpath Trail be re-opened, the Night Ride will proceed, about 7 miles south to the Botzum Trailhead. There, riders will enjoy free Oktoberfest-themed snacks, before turning around to head back to Peninsula. Not to be a buzzkill, but there will be no beer (except root beer) allowed or distributed on the Night Ride. Post-ride (or 8:00pm, if the ride does not occur): Head to the Winking Lizard Tavern next door, to enjoy a special tapping of Sierra Nevada Flipside Red IPA (“not your usual IPA”), which will be available at a special price of $4 per pint. The first 100 customers who order this special beverage will get to enjoy it in a free take-home commemorative pint glass provided by Sierra Nevada Brewing Company. 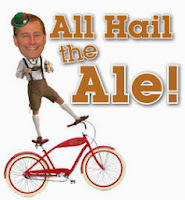 The “All Hail the Ale!” Night Ride on the Towpath Trail is free and no pre-registration is required. However, bring a few extra bucks, because the All Hail the Ale Night Ride wants to further celebrate Cleveland Beer Week by supporting its charity, the Malone Scholarship Fund. Cash donations will be collected during the pre-ride celebration. "The post-ride beer is a long and sacred tradition in bicycling, and this event helps us honor that while we celebrate Cleveland Beer Week," said Scott Cowan, owner of Century Cycles. 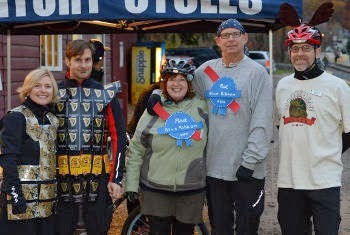 "Last year's All Hail the Ale Night Ride was a huge hit - over 200 people biked with us and most had decorated themselves or their bikes in some sort of beer-inspired way." Three years ago, Century Cycles conducted an online survey to ask Northeast Ohio bicyclists which style of beer they prefer after a bike ride. The overwhelming favorite among the 114 respondents was Ale/Pale Ale/IPA, which garnered 44% of the votes. That was followed by Wheat/Belgian (21%), Porter/Stout (18%), Light Beer (10%), and Lager (7%). While the Night Ride is FREE and requires no advance registration, Night Riders must sign a waiver before participating and are responsible for the purchase of their own beer and food at the Winking Lizard. This ride is at night, in the dark woods on an un-lit trail. That is why bicycle lights and helmets are REQUIRED (not to mention your own bicycle). Please note that parking is VERY limited at the Century Cycles store. We usually we recommend that you use the Lock 29 Trailhead parking lots just north of the store, but those will be closed if the shutdown continues, so you'll be on your own with on-street parking. Children under 16 must be accompanied by an adult; young adults under 21 should ignore all the excitement about the beer tapping. Finally, make sure those beer costumes don't hang or catch in a bicycle's spokes or chain (falling off your bike tends to ruin the fun) and that you can still wear your bike helmet in costume. See www.centurycycles.com/for/CleBeerWeek for all of the details. Now in their 19th year, Century Cycles Night Rides were in the national spotlight in 2009 when Bicycling Magazine, the world's #1 bicycling publication, dubbed them one of America's Great Local Rides. They are casual, ride-at-your-own pace bicycle rides (not races) about 14 miles long. All skill levels are welcome, but knowledge of bicycling etiquette and experience riding the Towpath Trail are recommended. Night Rides begin and end in the parking lot at Century Cycles' Peninsula store (1621 Main Street, on Route 303). See www.centurycycles.com/for/NightRides for tips on preparation and photos from past rides. Founded in 1992, Century Cycles is an award-winning, locally-owned chain of independent bicycle stores in Medina, Peninsula, and Rocky River, providing bicycles, bicycle accessories, and friendly, expert service to northeast Ohio bicyclists and their families. At its Peninsula location, Century Cycles also rents bicycles year-round for riding on the Towpath Trail in the Cuyahoga Valley National Park.